Akridge & Akridge Chiropractic is now offering CareCredit to patients to pay their bills. 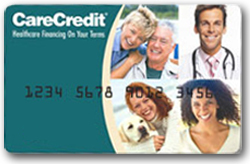 The CareCredit credit card account can be used for yourself, your family, even your pets. It is accepted by chiropractors, veterinarians, dentists, optometrists and other health care professionals. Patients will need to submit an application for the card. Once it’s approved, you can start using your CareCredit account right away. You can choose from several financing options. You will recieve monthly statements from CareCredit in the mail or online. Then you can make monthly payments, being sure to pay your balance in full by the end of the promotional period. To get your CareCredit card, please click here to fill out your application online. Please check with our office staff if you have any questions.